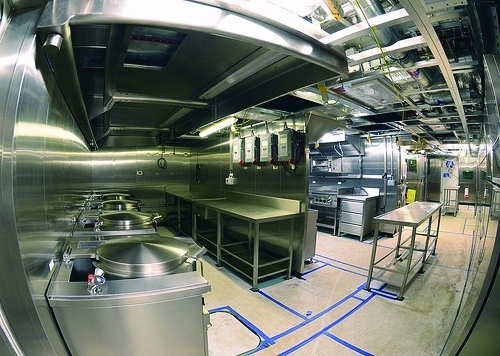 Looking back on 2013, the Aircraft Carrier Alliance (ACA) achieved a great deal in the assembly of HMS Queen Elizabeth – the first of the two new aircraft carriers for the Royal Navy. 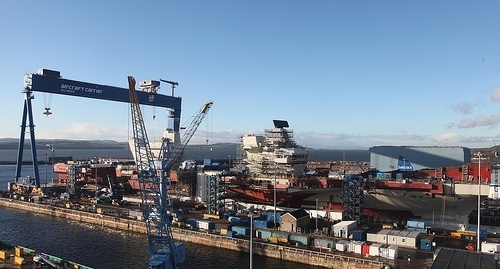 At the end of 2012, the two major sections of the hull had been skidded into alignment within the build dock at Rosyth. Since that time the remaining upper and sponson blocks have been assembled onto the hull, the two islands have been shipped and welded into position, the take off ramp has been fitted, and the Long Range Radar assembled on the top of the mast of the forward island. At the end of January 2014, the hull is now structurally complete and the scale of this iconic ship is clear for all to see. Since the manufacturing phase contract was let to the ACA in the middle of 2008 and looking back over the construction and assembly process, it is pleasing to say that all the major evolutions have happened at or before the programmed date. However, as everyone tells us, assembling the hull is the easy bit, commissioning and setting it all to work and proving the design is still largely ahead of us. 2014 is going to be an interesting and historic year for the project, working towards the naming ceremony for HMS Queen Elizabeth in the summer, followed by flooding up the dock, floating the ship out and mooring her within the non-tidal basin at Rosyth for the next phase of the work. This will be the point where the ship goes from being a building site to becoming a real floating ship. Once berthed in the non-tidal basin, the ship’s High Voltage system will go live, initially from a shore supply, with preparations taking place to start the ship’s generators and then onwards to propulsion trials. 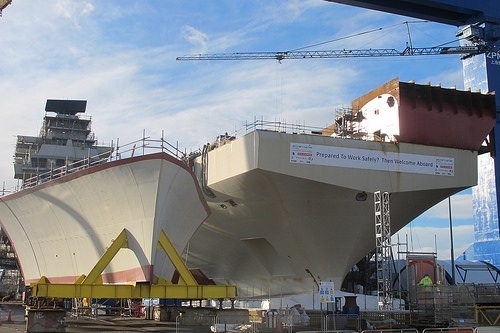 Once HMS Queen Elizabeth has vacated the dry dock there will be just a few weeks to rearrange the dock blocks before the first sections of the HMS Prince of Wales arrive in Rosyth, commencing the assembly sequence for the second ship. Having a key event such as the naming ceremony and flood up planned for the year really focusses the mind, and a detailed plan of work requiring completion in advance of these evolutions is being worked to. The fuel, aviation fuel, fresh water and ballast water tanks together with their associated cofferdams and sea chests are all being completed, painted and signed off. The installation of the shafts and the brake blades that will allow the shafts to be turned at up to full speed and up to 50% full power is starting. The underwater hull is being shot blasted and painted with anti-fouling paint which is intended to last until the ship’s first planned docking over 5 years away. Painting of the topsides is underway within the constraints of the great Scottish weather! Waiting for launch: inside on of Queen Elizabeth’s galleys. On the upper deck, the catwalks around the edge of the flight deck are being prepared and will shortly be painted with a heat resistant paint scheme. This will survive the thermal effects of the exhaust of an F35 jet while hovering on the approach to a vertical landing. This work also entails application of the thermal metal spray coating to the edges of the flight deck. This coating system will later be applied across the whole flight deck. The aircraft lift platforms are being prepared for installation. As might be expected there are a fair number of challenges in the installation and alignment of these massive lifts, but a clear plan now exists to install both lift platforms at the beginning of April. Meanwhile recognising that access to the ship and craneage is much easier while the ship is in the dry dock, served by the Goliath crane, than when afloat in the non-tidal basin, the chance is being taken to install anything that might be difficult to do later. This includes the platform at the stern for the SPN 41 Precision Approach Radar, the seating’s for the Glide Path Cameras and some CCTV cameras. It looks like 2014 is going to be another busy but very interesting year. So we gave away The second gereration Harrier and the short carrier that worked well. For a plane that can’t carry anything in a ship that is so big we can barely turn it round in port. We could have sold these to China. and probably got more orders. Even more disturbing is the fact we cannot operate any sea born military operations in the interim say in the Falklands. The Harrier is a far better base design to update. and the short carrier also more versitile. I dont think we have spent wisely’. Dont agree George. The Harrier is a very old aircraft, the F35 basic capability is far beyond any updates you could ever apply to a Harrier. And the short carriers offer very limited versatility, they are physically limited in the types and numbers of aircraft and operations they can perform, as well as being very old, inefficent designs. You cant possibly compare the two. The Falklands threat isnt a threat. The Argentinians do not have the military capability to launch an assault that couldnt be repelled with our existing stationed forces. Of course we want the option of the carrier force but from a Falklands perspective this isnt required for the foreseeable future. I must agree with Anthony there, in addition to updating the old system we have managed to keep many people employed through the recession and will soon have a world leading aircraft carrier system. Why would we want to sell this technology to the Chinese? The fact of the matter is that to deprive the RN of fixed wing operations for 10 years was folly and has left the country feeling vulnerable and being vulnerable. They should be phasing the Invincibles out as planned originally leaving a seamless takeover by the QE with a new generation of fixed wing aircraft replacing the Harriers at the appropriate time. What was done was damaging beyond belief. I hope the RN will rebuild its fixed wing and global projection of power. But how, with the chaos and confusion over the provision of aircraft and changes in policy? Fingers crossed. Not a wise defence policy, is it? I read an article earlier today, stating that the F35 joint strike fighter STILL hasn’t been approved over the pond and that the estimated cost supposed to be $129million, but in reality more like$212million. So much for a cost effective all round bells and whistles answer. I don’t have an answers how to rectify this, but I do believe its important to have a true carrier at our disposal. The preservation of the Free World oughtn’t be the responsibility of one nation. The QE can stand duty as well. The sea makes up 75% of the world. He that “projects” the most power governs the thoughtfulness of real politics. Let this be a 2nd Century of Modern Western Culture. In many ways large carriers like the QE are more of a political asset than a military one. Personally I wish the carrier had been equipped with catapults and the F35C. Would make them more compatible with US & French carriers. Also feel a few more Type 45 destroyers should have been built along with more than the planned 13 Type 26. I have a concern the loss of one ship could cripple the RN. The Taranis has now been shown to be a success and at the rate the f35 is going it will be obsolete before it enters service. The Typhoon needs to be navalised in STOBAR form for the RN and more tranche 3b versions for the RAF to replace the planned F35s. Then the late mark Typhoons can start flying with the production. Taranis developments. It is time to put UK interests first and back our own industry, which seems quite capable at supplying the RN and RAF with its fast jet needs without recourse to the politically motivated f35. I tend to agree with Anonymous. A force mix of navalised Typhoons and Taranises, the former for air defence and the latter ground attack could be quite a potent alternative to the F35. Whether the aircrft in quesiton could be adapted sufficiently is another question. I’m sure BAESYSTEMS must have looked at this in the past. Would the QE be able to accept this approach? Why would you need glide path cameras for a vertical landing??? A navalised Typhoon or if not possible the already carrier capable Rafale seems to be necessary to justify a carrier of this size. While Im sure the QE is a very capable ship surely the point of its size is to allow catapult & arrestor wires to be fitted for more capable aircraft. If we are indeed locked into buying a STOVL craft then I see little reason for such a large platform. Landings will not all be vertical – one of the UK innovations is the development of a “rolling vertical landing” which will enable the aircraft to return to the ship without jettisoning weapons or fuel either when it is carrying a heavey load or when it is operating in a very hot climate. Hence I think there’s still a glide path. Let’s not forget we entered into an agreement with the French to ‘share’ aircraft carriers. Leaving aside what that means, the French fly Rafales, which need a glide path. Until the F35s arrive, it seems we will be giving the carriers to the French for a while. Nice for them. With the benefit of hindsight, the US should probably have binned the idea of a STOVL F-35, and made two planes, a new Phantom (ie twin engined naval aircraft that could also be used on land) and an AV-8C Super Harrier for the US Marines. It would have been cheaper and avoided some of the expensive compromises that have been required to accommodate the STOVL variant. The Super Harrier would not have been as good as a F-35, but it would have been good enough for close support of troops. We would have then had to make a decision about whether we wanted a full-fat F-35 or an 80% solution in the form of the Super Harrier. The FAA had been a paper tiger ever since the withdrawal of the Sea Harrier, exacerbated by the requirement to send GR9s to Afghanistan which sucked up most of the deployable capability. Lusty went to the Far East with just 4 GR9s on board, Gordon Brown’s need for Afghan-inspired funding cuts meant that by 2009 the seaborne force was little more than a seedcorn capability waiting for the F-35. Google “Withdrawing Harrier – taking the right decision, no matter how wrong it felt” for an MoD civil servant’s view on the withdrawal decision. Don’t forget that the F-35C can’t use half the US carriers, as they’re STOVL-only, and it’s too heavy for the de Gaulle. So the F-35B is much more interoperable – and the USMC is probably closer to us in philosophy. A Sea Typhoon is probably doable – but would need vast amount of money spending on development costs across a relatively small number of airframes. Money we don’t have. Taranis is still a work in progress – they’ve achieved a lot but there’s still a lot of technical and legal issues to sort out. It’s not very relevant to the first generation of aircraft on the QEs. And of course it would need catapults on the QE – which would be very awkward to do, on published figures it would almost be cheaper to just build a new carrier. Don’t forget that HMG gets 50-odd F-35 for free thanks to our generous workshare package. Big carriers carry more aircraft and can operate them more efficiently. You can debate the original requirement for 144 sorties/day, but once you accept that then two biggish carriers deliver that requirement more efficiently and cheaply than more smaller ships. We won’t be giving the carriers to the French. We are already flying F-35s, and the first full squadron should work up just as the QE completes its basic sea trials. It’s almost like someone had put some thought into coordinating the two. The best aircraft for STOBAR ops would be the Sea Gripen. By happy co-incidence lots of UK content!